Since 2005, the legal team at Kisling, Nestico & Redick has worked tirelessly to support residents throughout Ohio by providing exceptional service and conscientious representation to those who have been impacted by personal injury accidents. In fact, the law firm remains one of the fastest-growing personal injury firms in Ohio. Through hard work, exceptional legal expertise, and a strong desire to serve its clients, it now has 10 offices located strategically throughout Ohio. Its team includes nearly 40 personal injury attorneys and an additional support team of 100 dedicated individuals who strive to help the community in numerous meaningful ways. Kisling, Nestico & Redick’s devotion to serving the community is evident in its exceptional track record of successful cases, as well as in its philanthropic efforts. Most recently, Kisling, Nestico & Redick donated $1,200 worth of food to Greenbriar Middle School in Parma. The firm’s managing partner, Rob Nestico, acknowledged the donation by stating that spring break should be a time when kids can relax without worrying about where their next meal will come from. The law firm’s donation included 60 grocery bags filled with macaroni and cheese, bread, peanut butter, fruit, and other delicious items. To ensure that those in great need received the donation, the law firm contacted the school district’s director of family and community engagement for assistance. The director immediately suggested Greenbriar Middle School, which provides free or reduced-price lunches to almost half of its students regularly. The director was also aware of a private food pantry at the school that was stocked by concerned teachers and discreetly provided children with food. Without those free or discounted meals each day during spring break, some of those children may go hungry. The school’s principal described the donation as “overwhelming.” This is only one of many philanthropic efforts included in the KNR Cares About Kids initiative, which will span across a full year and help Ohio’s kids in incredible ways. Nestico is no stranger to misfortune. As a teenager, he was severely injured in a serious car accident that involved a fatality. After spending three months in the hospital recovering from his injuries, his parents were hit with huge medical bills. As immigrants who were unfamiliar with the English language, he saw first-hand how unscrupulous large corporations could be. He has devoted his professional career to helping others fight back and obtain the justice they deserve. Moreover, he strives to help his community in significant ways, and his law firm stands behind that commitment. Only a few weeks before making this large food donation to the children of Greenbriar Middle School, Kisling, Nestico & Redick took another bold step to serve the community’s children in need through its KNR Cares About Kids campaign. 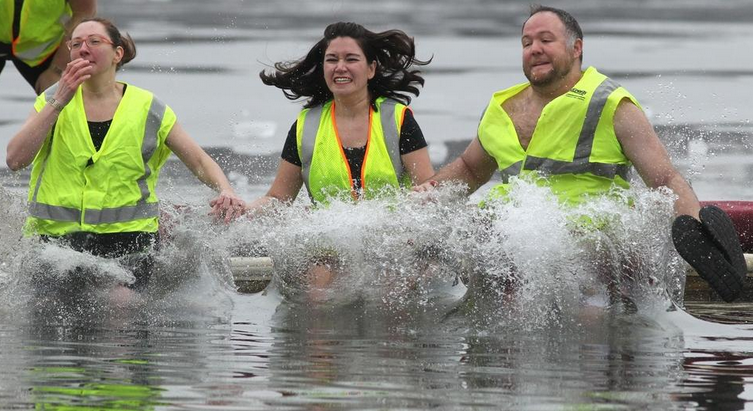 The law firm organized a team to participate in the Portage Lakes Polar Bear Jump. The Portage Lakes Polar Bear Jump started in 2004 with 70 brave individuals taking the plunge in icy waters. This event has supported the Akron-Canton Regional Foodbank throughout its history, and it has become increasingly popular. In fact, in 2018, more than 800 people participated in the event to raise money for the food bank and awareness about the hunger problem in Ohio. The food bank distributes the donations it receives to approximately 500 local food pantries, as well as shelters and other venues and organizations throughout eight regional counties. Kisling, Nestico & Redick has sponsored a polar bear team every year since the event started, and it has cumulatively raised approximately $109,000 over the years. In fact, it successfully raised over $26,000 for the event in 2018 alone. This year, the company’s surpassed its $25,000 goal, and raised over $30,000, which will provide over 120,000 meals within the community. According to the food bank’s president and CEO, approximately 20 percent of the children in its regional service area struggle with hunger. The food bank knows how to stretch each dollar that it receives in donations. A single dollar can provide four essential meals to those in need. He specifically noted that the efforts of Kisling, Nestico & Redick at last year’s event generated 100,000 meals for local residents. Prior to making the large food donation to Greenbriar Middle School and participating in the Portage Lakes Polar Bear Jump, the team at Kisling, Nestico & Redick sponsored the Coats & Cans for Kids Turkey Giveaway in November. This annual charitable event started in 2013 and has had a huge impact in the community. The law firm asks attendees to bring gently-used jackets or non-perishable food items as donations. In exchange, attendees receive a free turkey. In addition to distributing turkeys for the holiday season, the law firm donates all collected food to the Akron-Canton Regional Foodbank. It donates all jackets and coats received through the event to the Salvation Army. Since the event’s inception, food donations have provided approximately 269,000 free meals to local residents. These are just some of the most recent examples of the law firm’s philanthropy. Its strong desire to serve the community starts at the top level with the firm’s founding members, and the participation of its employees is profound. Some of the many other ways that the law firm gives back include a school supply giveaway at the beginning of each school year and special social media events that support charitable organizations. According to Nestico, the law firm strives to make a difference in the community in and out of the courtroom. Kisling, Nestico & Redick recognizes that it has the power to do more than fight for its clients’ rights in court.